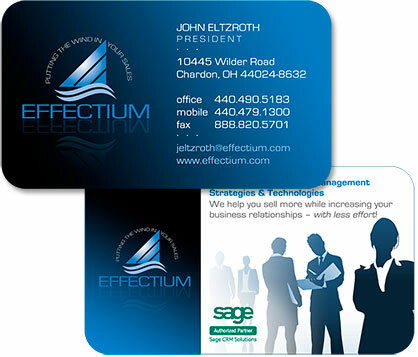 Business cards, along with logos, are often the first impression of your company and should be taken very seriously. Not only do they convey the degree of professionalism of your company and provide valuable contact information, but should also work as a “mini magazine ad” and impress your audience with stunning graphics and compelling service information. 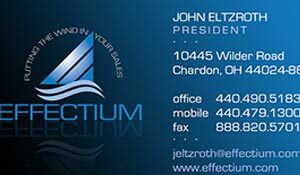 Initial meetings with owner, John Eltzroth where he communicated his desire to incorporate his love of sailing into the Effectium ID. Propose plan for designing his new logo and propose a few new slogans incorporating sailing theme. Upon approval of these, we designed his business card 9with future website in mind) to get overall color scheme and visuals worked out. And finally, Edcom designed the website in a cohesive manner, consistent with the above efforts.